If you are like most people, you have always wanted your own hot tub or spa. Maybe your parents had one when you were growing up or you just had the opportunity to sit in one at some point. Either way, you got the taste for it, and once that happens, it is almost impossible to ignore. But most people still do not follow through with getting a hot tub because they mistakenly think that it is too expensive, too complicated and far too much work to maintain. 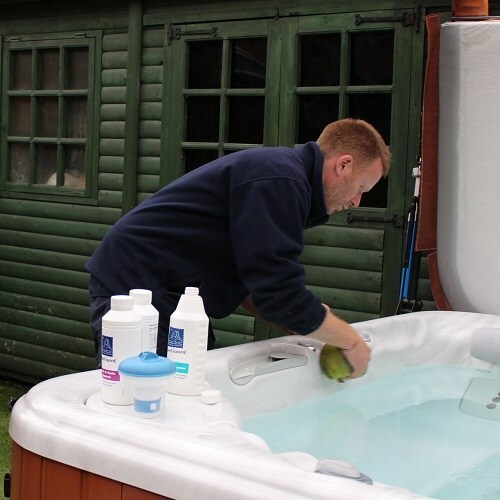 That’s not the case at all, and in this article you will learn just how easy is it to get a hot tub and maintain it, as well as all of the options available, some of which are affordable on any budget. What Is A Hot Tub Or Spa? There are a lot of benefits to having a hot tub or spa in your home. You obviously can relax in it whenever you want, and the recreational value of a hot tub is the main reason that people get one. There is nothing better on a clear night to go out and soak in the hot tub for a few hours, reading a book or watching a movie on your tablet or smartphone. But there are also quite a few hot tub health benefits. The first is that you get to relax and soak in hot water and this can be extremely good for stress levels. Reducing your stress can improve everything from your blood pressure to your mental health and it is one of the best ways to relax. If you suffer from muscle spasms, sciatica or a variety of other muscle or nerve conditions, a hot tub can help to relieve your pain as well. Hot tub jets can knead tight muscles and cause the body to feel healthier. Joints, back muscles, legs, shoulders and everything in between can be improved with a hot tub. You can even get your doctor to write you a prescription for a hot tub, and while your insurance will probably not pay for the cost of the spa itself, you might be able to forgo the sales tax normally charged, which could come up to several hundred dollars, depending upon the price of the spa. These days, the words hot tub and spa are used pretty much interchangeably. In fact, there are four words that are generally used to refer to a heated tub filled with water that has jet action: a hot tub, a spa, a Jacuzzi and a whirlpool. We will be using them pretty much interchangeably here as well. But if you want the technical definitions, a spa is generally molded and made from fiberglass, while a hot tub is made of wood. A Jacuzzi is actually a brand name in the hot tub business and a whirlpool refers to the circular action of the water on many models. Hot tub dimensions are something that you will see whenever you look at an online listing for a hot tub. No matter what type of hot tub it is, you will always find dimensions, and they are useful because once you know the measurements of a hot tub, you can decide where it is going to go in your home. The dimensions may be listed one of two ways, and in many cases, both. The Length-by-Width-by-Depth is the dimensions that will usually be listed near the shipping weight. These are usually in inches. However, you may also see the length and width combined into one number – usually in feet- if they are both the same measurement. So for example, you may see a hot tub that is 74x74x27 inches or 6’. 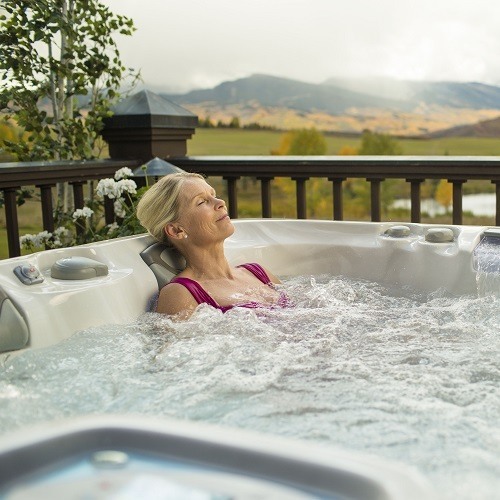 Weight is one of the most important aspects of your hot tub because it will determine where you can place it, and how you are going to get it to the installation location. But the weight of a hot tub depends entirely upon what type of hot tub it is. Portable hot tubs like the inflatable ones don’t weigh very much and can be stored in a closet and then brought out when it is time to set them up. Plug-n-Play hot tubs, in-ground hot tubs and other permanent fixtures can weigh several hundred pounds or more which is a lot more restrictive. There are several hot tub designs to be aware of as well. The shape of the hot tub is usually the main design feature. For example, there are circular hot tubs which generally have molded sets built in on the inside. There are also square hot tubs which many people prefer and then there are hexagonal or octagonal shapes. The style of hot tub that you choose is really a matter of personal preference. All of the shapes and design styles out there will seat the number of people that you want. Octagonal shapes may seat a large group better, but even a circular spa that is large enough will seat 6-8 comfortably. 1-2 Person: Very small – like a large bathtub. 2-4 Person: Intended to fit two people comfortably. May be a little less roomy with four. Will probably even squeeze in five. ​4-6 Person: A large hot tub that 5-6 people can probably sit comfortably in, but four people will have a lot more room. 8 Person or More: These can be either really cramped for 8 or they can be huge with plenty of legroom for each person. We should mention that there are certain spas out there that are intended to be energy efficient. They use less power; they conserve heat better and have various other factors that make them more energy-friendly. But the best way that you can have energy efficiency is by doing things like buying an electric tankless heater, getting an insulated cover or find out when you are being charged non-peak rates. These tips come from the experts at the Ecosmartus Blog. We would add one more that they didn’t mention: make sure that you aren’t getting more spa than you need – referring mostly to capacity. There is no sense is maintaining the heat in a six person spa if there are only two of you. Now, let’s talk about the types of hot tubs that are out there. There are many different kinds, but there are three big ones. We already discussed the four names that hot tubs go by and this is similar but in this case, the names actually portray accurately what kind of hot tub it is. The home hot tub can be placed in many different locations, but it is mainly how it is installed that determine what type of hot tub it is. 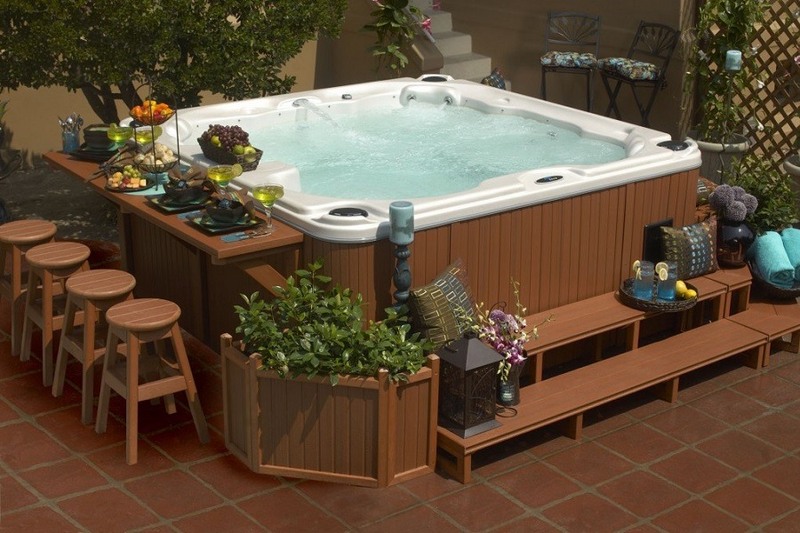 A backyard hot tub may not be in the back yard at all, but instead on the side set up on the deck, or installed indoors even. One of the best outdoor hot tub ideas to come along is the Plug-N-Play hot tub, also known as the portable hot tub. The name comes from a computer term that means that everything is self-contained and all you need to do is plug it in and it is ready to go. 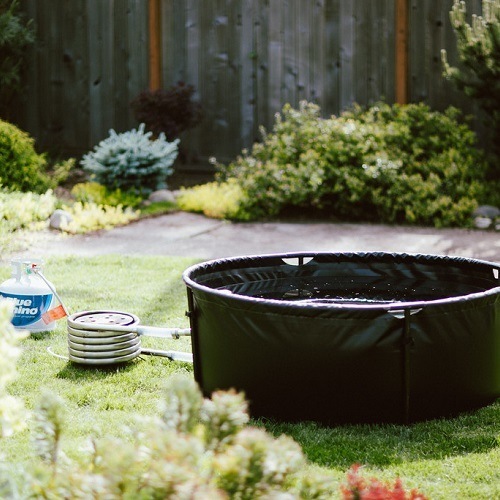 In this case, you have to fill it with water and do your chemical testing and treating, but compared to the hot tubs installed by most retail stores, the plug-n-play hot tub is pretty simple. They often cost less than the ones you find at retail stores and can work off of standard electricity outlets in many cases, albeit usually only on a dedicated circuit. The next type that we will discuss is the built in hot tub. This is the kind of tub that you would buy – usually from a retail store – and have it actually built into your home. You may install it in its own gazebo or on the deck, but most people build a recess and install it that way. This type of hot tub is not really meant to be removed if you decide to sell your house. Of course, adding a hot tub increases your home’s value considerably but if you want to take your hot tub with you when you move then you may want to consider a different type – like the plug-n-play model described above. 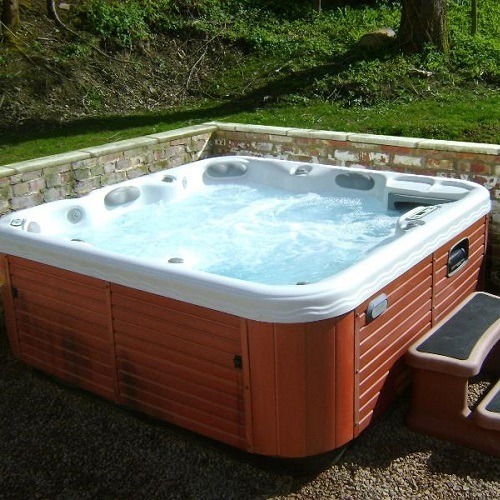 The inflatable hot tub has become one of the most popular types of hot tubs on the market today. Because of how strong the material is and how small the chances are of an inflatable model popping, you can get almost as much durability from an inflatable model as you would from a fiberglass one. 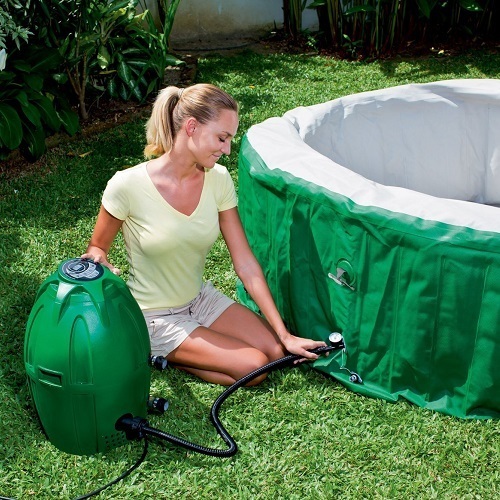 Inflatable hot tubs come with their own pump which fills the hot tub quickly with air. You then add water and do your chemical treatments. You can remove the water and let out the air if you need to store this hot tub away – which is a really good idea in the winter. As a side not, we will also discuss exercise hot tubs. 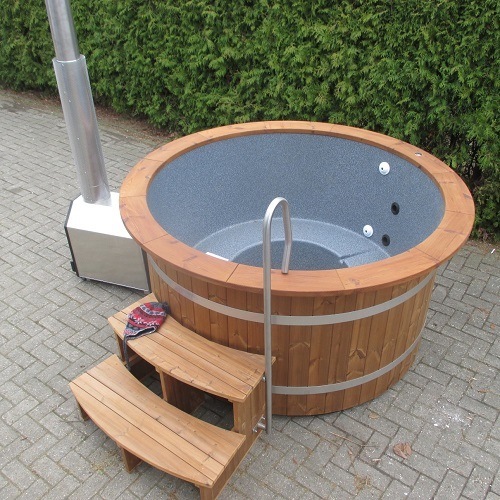 An exercise hot tub or hydrotherapy hot tub is one that is designed specifically for doing hydrotherapy in. 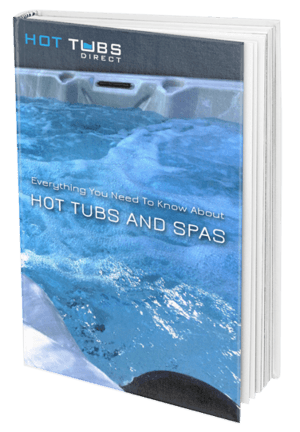 Basically, you could consider any hot tub to be a hydrotherapy hot tub, because of the jets and the hot water, but an exercise hot tub is more specific than that. 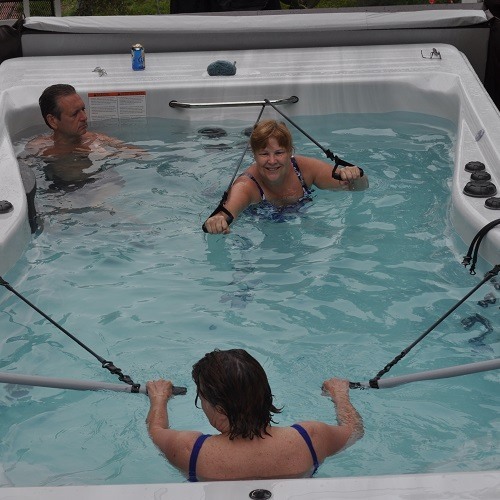 Often, exercise hot tubs are outfitted with extra like handholds and bars to allow for physical therapy. Of course, it completely depends upon what your doctor recommends and what kind of spa you have access to. But hydrotherapy and exercise in a spa can both be very healthy. Next, we’re going to discuss some of the maintenance required when it comes to hot tubs. Maintaining your hot tub is very important because when you want to soak in the water, you want it to be as safe as possible for you and your family. So, you start with hot tub testing supplies. That generally means test strips. A test strip generally will test between one and three things about your spa water, but you want it to test all three at once – especially since the majority of the test strips on the market do just that. The test strips will allow you to see what is going on with your water. Spa and hot tub writer Gina Galvin says you should test your hot tub water 2-3 times a week, or even more often if your spa is getting used several times a week. Chlorine and Bromine are sanitizers to keep your water clean. You already have a filtration system for your hot tub – at least with most models on the market – but these chemicals give you an extra measure of protection and this is especially important if you have kids. Some people like to use a chlorine drip device. This is a unit that continually puts chlorine in the water, keeping is as clean as possible, which is circulated by the uneasy waters within the hot tub. Other people just make sure to add chlorine on a regular basis. Another thing that you are going to be keeping an eye on is the amount of calcium in your water. Calcium hardness will not make for a comfortable soak and it will not be good for components like your filtration system or any other mechanical components that the water touches. Hard water just isn’t a good idea. Some spas come with water softeners built in, but they are usually the expensive models. You are better off testing your water regularly for calcium hardness and then using a process to soften your hot tub water. You’ll want to research the exact method yourself since everyone has a different way that they prefer. There may be other chemicals that you will want to use on your hot tub depending upon your personal preference, but there is a final process that you should make sure happens. 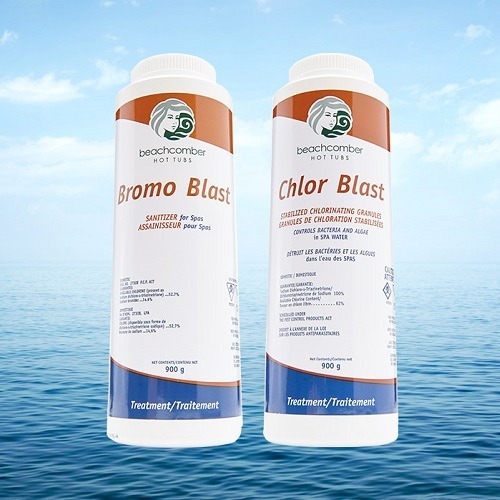 Shocking your water with a generous amount of bromine or chlorine will break down any organic components in the water and change it from a cloudy state back to a clean one. Your hot tub cover is one of the accessories that go with spas and hot tubs, but it is such an important component that we have chosen to list it here separately, rather than including it below with all of the other accessories. A hot tub cover keeps your water warm so that you spend a great deal less on your electricity bill maintaining that temperature. You don’t have to cover your spa, particularly in the summer, but if you don’t, your water will get cool during the overnight hours and you will have to spend energy heating it up again. Your cover also serves other functions as well. In the winter, it keeps snow and ice from getting into your hot tub, plus it protects your water from debris and insects, as well as keeping wild and domestic animals out. A hot tub without a cover can pose a drowning danger to cats and dogs. Most hot tub covers are manually placed onto the hot tub but some are included and use a hot tub cover lift to make it easier to remove the cover. Some covers are sold by themselves by a completely different manufacturer and designed to fit your spa perfectly. The final thing that we will discuss is the hot tub accessory. 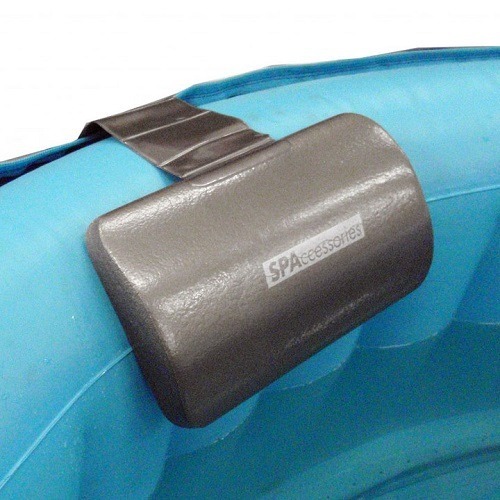 Hot tub accessories are things that you either need to use your hot tub effectively, or that enhance your experience. We already discussed two big things – the chemical testing and treatment kit (consisting of test strips, chemicals, etc.) and your hot tub cover. However, there are some other accessories out there that you may want to consider investing in, if they do not already come with your spa. Even if they do, you can always enhance your experience with more or better items depending upon what they are. Let’s start with how you are going to get in and out of your hot tub. 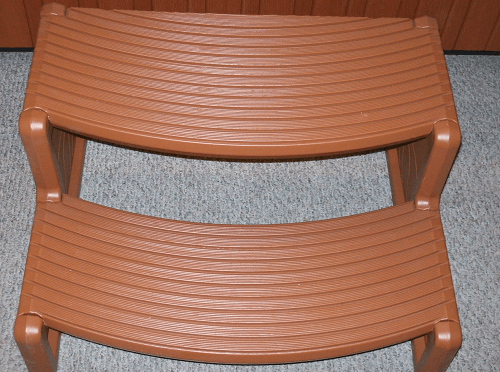 A set of hot tub stairs can be a huge help when it comes to getting in and out of your hot tub. 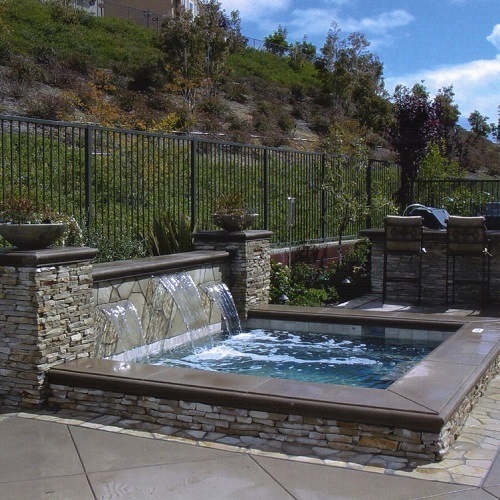 You can have either a set of stairs on the outside, which is best for hot tubs that are several feet off of the ground, or you can have a set of stairs inside the hot tub and actually under the water, which is great for hot tubs that are set into the ground such as the built-in hot tubs discussed earlier. You can even have a set of stairs in both places. The most important things to keep in mind when buying stairs for your hot tub is that they are stable and will not fall over when you try to climb them, as well as having traction for bare feet when climbing in and out of your whirlpool. Hot tub trays are the next thing that we are going to talk about. 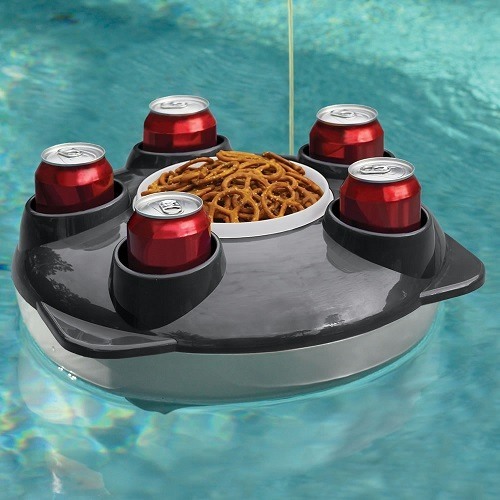 Hot tub trays are great because you can set them up to float in the water and then put food or beverages on them so that they are within easy access. This is useful if your hot tub seats are close to the floor of the spa and you have to stand up to reach the edge. 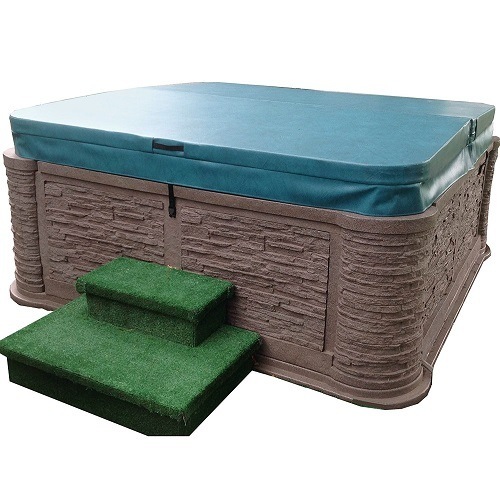 Hot tub trays will usually have secure places for you to put your drink and any other items. Since the water churns rather quickly in a hot tub a regular tray with a can of coke on it could easily tip over. Hot tub pillows are another popular item. Pillows or cushions make your time in the hot tub more comfortable. This is especially useful if your hot tub isn’t all that comfortable on its own. You can get pillows for your seat and pillows for your back and in some hot tubs, you can even fasten them down so that they do not float. 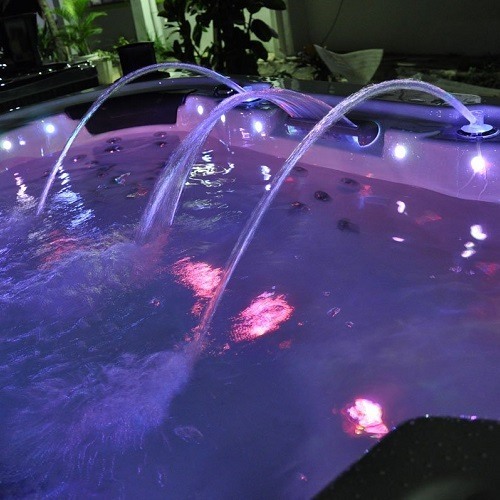 Hot tub lights are yet another accessories that is quite popular. There are two types of hot tub lights. The first is the reading light or regular white light that allows you to see what you are doing in the hot tub. This is important if you do not have lights near your hot tub and you plan on using it at night. The other type of light is more aesthetic and they are usually set into the hot tub itself and are LED. They may change color or have different lens caps and they look quite beautiful in the water.